Combining InterKnowlogy’s thirst for using the latest and greatest technology with our world famous ping pong skills provides the following result: during RECESS, I am making a small device that allows us to quickly keep a digital score of our ping pong matches. Internet of Things (IoT) is a hot topic these days, so I decided to implement the ping pong scoring system on a Netduino board. I had dabbled with an older board a year or more ago, and was frustrated: one of the first things I wanted to do was make a call to a web API service, but there was no network connectivity. 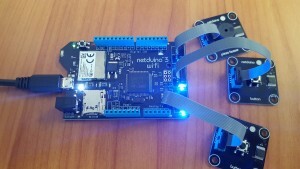 Enter the newest board, the “Netduino 3 WiFi“. It has a built-in button and LED, but it’s extensible by way of the 3 GOBUS ports, where you can easily hookup external modules. This board has WiFi (sweet! ), which means you need to get it on your wireless network before you go much further. Use the .NET Micro Framework Deployment Tool (MFDEPLOY) to configure WiFi on the board. Set network SSID, encryption settings, network credentials, etc. Reboot the device to take on the new settings! After installing the VS plug-in, you now have a new project template. NOTE: There is a bug with the on-board button in the current Netduino 3 board firmware. While your application is running, pressing the on-board button will cause a reset of the device, not a button press in your application. The work-around until the next version of the firmware is to reference the pin number explicitly, instead of using Pins.ONBOARD_BTN. See my forum post for more information. Now attach a GOBUS button module and the code is a little different. 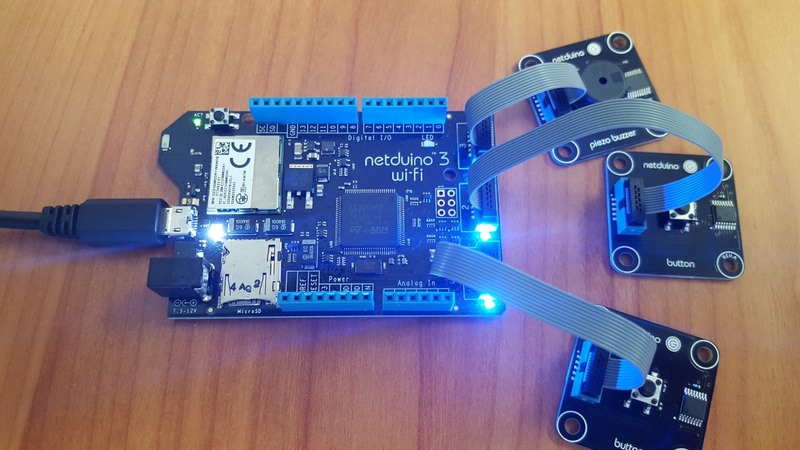 The Netduino SDK provides classes specific to each module that you use instead of general input / output port classes. The natural way in .NET to react to button presses is to wire up an event handler. The GoButton class has such the ButtonPressed event, BUT, there’s a bug in the firmware and SDK: If you react to a ButtonPressed event and in that handler method (or anywhere in that call stack), you make a call on the network, the call will hang indefinitely. I discuss this and the work around with others in the a Netduino forum post. It’s kind of ugly, but instead of wiring up to the events, for now (until the Netduino folks get it fixed), you just sample the IsPressed state of the button in a loop. Add a reference to Netduino.GoButton. Add a reference to Netduino.PiezoBuzzer. You bought this board because it has WiFi, so you must want to call a web API or something similar. In my case, I wrote a simple OWIN based Web API service, hosted in a WPF app that is my ping pong scoreboard display. This gives me the ability to receive HTTP calls from the Netduino board & client code, straight into the WPF application. So a call from the Netduino application code to something like http://1.2.3.4:9999/api/Scoring/Increment/1 will give player 1 a point! I do this using the HttpWebRequest and related classes from the .NET MF. In my case, the results from my API calls come back as JSON, so I’m using the .NET Micro Framework JSON Serializer and Deserializer (Json.NetMF nuget package). Putting that all together, I have a couple physical buttons I can press, one for each player, and a WPF based scoreboard on the wall that removes any confusion about the score! Hope you too are having fun with IoT!